ALL exercises in armwrestling divide into multi-joint (also known as basic) and single-joint (isolating). In the first type movements, several joints are involved together. The classic example is a bench press or pulling handle across your body from a cable machine. In its turn, when you perform dumbbell curl, only one joint, ulnar, is bent. This is the example of single-joint exercise. The main distinctive feature of basic exercises is that they ‘load’ several muscles at once. In isolating exercises, only one muscle usually works. Beginners need multi-joint basic exercises because thus they ensure that several muscles get stronger. Thereby they enable beginner to overcome the initial “weak phase” quickly and to form basis for further trainings with big weights. It must be emphasized that basic exercises can load one muscle more intensively than the others. For example, side pressure exercises load both chest muscles and ulnar ligament. It is generally known that there are more power exercises in armwrestling than in any other kinds of sports. The problem is that athletes train their arms and body parts no more than 3-4 times a week by performing no more than 4-6 exercises per training. It means that one should aim at making the right choice of exercises which would enable not to waste one’s time loading the organism and blocking the possibility of fast and correct development of power factors at every stage. In short, when working on creating your own training system you must not perform all exercises within single training, but distribute them into several trainings. REP is a single performing of an exercise. For example, if you did 10 curls in succession it means that you did 10 reps. For the initial one-two weeks of training use small weights in order to perform strictly 15 reps in a correct fashion. For a beginner it is an ideal chance to master the technique, to learn how to manage muscles and to ’feel’ the exercise. The latter will come in handy in the future: ability to ‘feel’ the exercise helps armwrestler to understand how much effective it will be during the actual wrestling. AFTER this ‘introductory’ period (1-2 months) you can do 6–12 reps in a single set and 25-15 reps in a light warm-up set at the beginning of every exercise. You must work with weight that enables you, first, to perform the prescribed number of reps with a right technique, second, to lead muscles to ‘failure’. Muscular ‘failure’ is what you fell when you cannot do any reps with a correct technique. If you cannot do six reps with a correct technique it means that the weight you took is too big for you. If, vice versa, you can more than 12 reps it means that the weight is too small and the load must be increased. Note: numbers 6 and 12 are not spun out of thin air. Sport scientists found out that the fastest results can be obtained by the beginner when exercising with weights of 80% from the maximum, with which one can do one rep. The majority of professional armwrestlers can do 6–10 reps maximum with such weight. SET (or series) is a number of reps of one certain exercise. For a beginner, it is better to start each exercise from 1–2 warm-up sets with small weight (especially if it is the first exercise of the set for the certain muscle group). Then 1–4 "heavy" sets shall follow. Thus, we get 2–5 series for an exercise in total. DURING THE INITIAL trainings it is better to use small weights in order to ‘feel’ an exercise and to learn how to do it correctly. In a few weeks, after having mastered the correct technique, you can increase your load. Usually the first set of exercises with 16–20 reps is performed with small weights even by experienced arm-wrestlers in order to warm-up ‘target’ muscles and connective tissues and to fill them with blood. For the second set composed of 10–12 reps some weight must be added. If it is easy to do an exercise and you can do it with a right technique, you can add more weight. If you do the same 12 reps again with correct a correct technique you shall try to increase load but just for a little. (Gradual weight increase with every new set is called ‘pyramid’; it is one of the safest training methods). ADD weight until it becomes very difficult for you to do 6–10 reps. Your task is to train with such weight in the future that after 6–10 reps muscles "fail" to work. Having established such a ‘critical weight’ for yourself continue training until you become stronger and can increase number of reps. If you learned to overcome 10 reps with this weight with ease it means that it’s time to increase it by approximately 10%. New heavier weight is a new ‘challenge’. With such weight you’ll be unable to do 10 reps for the first time but you will succeed in this with time. Continue following this scheme in your training. The basis of this scheme is the so-called ‘overload principle’. In short it means that you should regularly give a muscle load higher than it got ‘used to’. In response to growth of work weights muscles begin accumulating protein in cells (titin or connectin - elastic protein), i.e., they become stiffer and stronger. "Usual" load does not provide such effect. That is why you must permanently increase weight in order to achieve the desirable result. Watch your advancement on ‘stairs’ of weight increase. Keep the training diary offered by us. You can rest for the amount of time just required by your body to recover after the previous set. Usually it takes 45–90 seconds. It takes more time for large muscles to recover, and as for very small muscles they return to ‘operating’ condition much quicker. On days when you do exercises with small weights I advice you to have a rest for 120-180 seconds between sets. My advice to the beginners who have no wrestling experience and no understanding of technical moves would be not to begin trainings from actual arm-wrestling. As a rule such approach leads to painful feelings in the area of an elbow, to injuries, micro-traumas or removes any desire to train further. A beginner must work on his technique and moves under the control of a coach or an experienced sparring partner in the form of only educational actions / exercises without the use of maximal force. I advise to do this no more often than once a week. For those of earlier age the training plan can be built on working on technical skills/moves and power training simultaneously. I am already warning you, don’t do this without a coach or an experienced sparring partner. Otherwise it is easy to injure your arm. 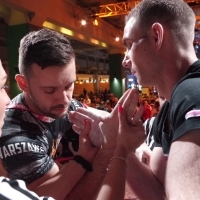 The main thing about knowing arm-wrestling techniques is to set in motion as much ligamentous and muscle apparatus as possible or, to speak in scientific terms, motor units MU, interacting with the opponent’s arm in attack, defensive or counterattack motion. Do not hurry in trying to determine your technical skills during the initial period. As a rule, it can change due to power increase in the certain muscle group. It is most desirable to master several technical moves and to change them depending on tactical set to these competitions/single wrestling. This question is asked frequently. First of all you must begin with mastering power load on muscles and ligaments. You must prepare your organism to loads close to competitive ones, strive to achieve ratios close to power factor standard in different WA (working angles), and then use them in performing special moves and techniques in the course of actual wrestling. These are the main angles that must be exercised during the initial training close attention should be paid to ensure correct proportions of their development. For the share of each angle, their respective ratio is expressed in equivalent percentages. These proportions are interconnected and disproportion between them will lead to distorted technique, pain in weak links, and, in the end, to injuries. On the assumption of aforementioned, the strength of fingers plays the key role in arm-wrestling, i.e. you should pay attention to the fact that biceps power with under-grip and hammer grip shall not exceed finger power, otherwise it will be difficult for you to master "hook" or "top roll" techniques, and perform each of the respective elements of those techniques without mistakes. Your opponent will be blocking your attacking moves knowing that you have weak fingers. We will return to exercises for fingers later. Hand plays an important role as well. No less than 90% fall to its share, i.e. if you do an exercise with 100 kg weight on fingers, weight on hand shall be no less than 90 kg. If weight is more it means that your fingers are not strong enough, if it is less it means that you should include additional exercises for hands in order to eliminate disproportion. Strong hand in hammer grip predetermines whether you will wrestle with ‘upper part’ technique or not. The so-called ‘stretching’ technique is important not only in ‘upper part’ wrestling, but also for those who use ‘hook’ techniques since they need strong hand in this position and thus for the share of strong hand with hammer grip 85% of finger power fall. Concerning different technical skills you’ll have to choose depending on what you’re capable of, the key aspect here being biceps power in two positions: under-grip and hammer grip. Pay attention to proportions relative to your fingers and hand. There commonly occur large disproportions between biceps and fingers that, as a rule, lead to distortion of technique and moves of power transportation to the other links of your hand, frequent injuries and inconveniences resulting from disproportion. There are also other factors that relate individually to each technique and for the higher level. At the beginning of your sportive career, try to eliminate disproportions and gain your potential following fundaments/proportions given in the table for beginners.